And today's winner is... direction Metz! When a man's gotta go, a man's gotta go, and talking to Kurt our German marina neighbour this morning convinced us that Metz needed he and we more than Flavigny did. Our first challenge for the day was to get down the three small locks from Toul to the Mozelle, which is not usually a great feat, but this morning half the harbour decided to do the same thing and before the locks opened there was a queue of five boats to go two at a time down the stairway. Each time two boats left, another two would join the queue, leaving those in the harbour watching the parade in some merriment. We were convinced that the total number of boats leaving actually exceeded the number contained within the harbour overnight. Ninety minutes and two cups of coffee later, we took our place in the queue, by this time down to three, (still one more than a canal lock can hold) and by lunchtime we were out onto the river and at the same monster lock that I photographed full of ship on Sunday. Given that we are not much further than half way down it's length, and the smallest of the boats ahead is around three metres longer than us, the scale of the ships starts to have an impact. In the absence of any more complicated calculation being needed while we were being gently lowered to the next level down, we figured that we could comfortably fit 52 boats identical to ours in one of these things, yet only one freighter manages it! 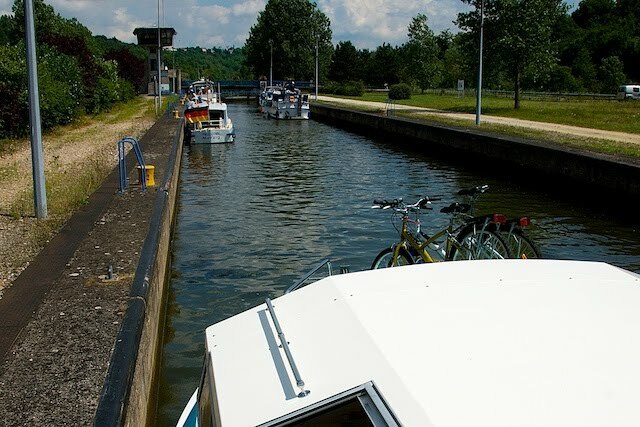 Eight hours, forty-one kilometres and half a dozen monster locks later, we pulled into Pont-a-Mousson, past the half way mark with only two locks tomorrow, but also past several villages which will slow our return journey. Curse you Kurt and your contagious urgency.